This is the first in-depth study of this style of garden design and is written in two parts. In the first, Robin Whalley skilfully unravels the tangled story of the 'knot garden' as it transforms itself from the curious knot of Tudor times into the great embroidered layouts of the seventeenth century. The English landscape garden all but obliterated formal patterns but they emerge again with the extravagant flamboyance of the Victorian parterre. Here, brilliantly illustrated, is the alternative history of British gardening - no Capability Brown or Gertrude Jekyll - but a story that embraces all the decorative arts. At last it is possible to see how the designs used in weaving, embroidery, carpentry, glazing and plasterwork appear again and again mirrored in the garden. In the second part of the book, Anne Jennings takes the story from history to practice. 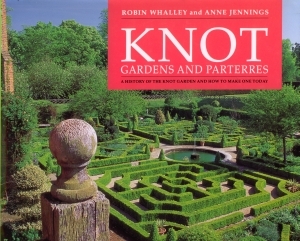 It is for the gardener and shows how the concept of the knot garden is ideal for today. Based on a structure that is eye-catching all the year through, the knot garden can be brashly exuberant, romantically nostalgic or quietly simple and chic. The choices and opportunities are clearly set out with fresh enthusiasm by an expert and practical gardener who confidently takes the reader through every stage from initial planning, design and choice of plants to the nitty gritty of care and maintenance. The appeal of the knot garden is timeless and the idea has an obvious attraction when space is at a premium. This stimulating book is a pioneering combination of serious history and practical gardening. Superb special photography and intriguing historical visual sources guide the reader through. Robin Whalley is a garden historian with a particular interest in formal gardens of all periods and the way the decorative arts and crafts have always been part of the history of garden design. He teaches on architecture and landscape history, organises specialist tours and cultivates his own garden in the Brecon Beacons with a keen horticultural knowledge and a scholarly interest in plants. Anne Jennings is the Garden Director for the Tradescant Trust and the Museum of Garden History in Lambeth, where she looks after the knot garden designed by Lady Salisbury. She runs various popular courses including one on knot gardens and offers an invaluable combination of practical knowledge, love of plants, design flair and enthusiasm and experience as a teacher.